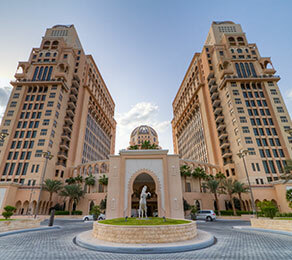 Surrounded by the magnificent waters of the Arabian Gulf and close to Doha’s diplomatic area, the 336-room St. Regis Doha is located in the heart of the city’s business and commercial district. The hotel comprises two adjoining, ‘‘reflecting’’ towers, each consisting of 14 floors, and including 246 rooms and 82 suites. The complex also offers a business centre, as well as approximately 13,400 m2 of meeting and conference space. CCL was commissioned by the main contractor, Construction Development Company (CDC), to carry out the design, supply and installation of 100,000 m2 of post-tensioned slabs and beams. Construction took place during a period of material shortages in the state of Qatar. CCL proposed an alternative solution to traditional reinforced concrete, which reduced the quantities of concrete and passive reinforcement required for the project and which provided an accelerated schedule of work. This ensured that the project was successfully completed on time, despite the prevailing material supply issues in the market, and within budget.